"A shutdown falls on the President's lack of leadership. He can't even control his party and get people together in a room. A shutdown means the President is weak." – DJT, 2013. Those who mourn Dr. King because they were his closest followers should meditate the implications of the deed of the wildman who killed him. That deed should bring to mind not (for God's sake) the irrelevance of non-violence, but the sternest necessity of reaffirming non-violence. An aspect of non-violence is submission to the law. The last public speech of Martin Luther King described his intention of violating the law in Memphis, where an injunction had been handed down against the resumption of a march which only a week ago had resulted in the death of one human being and the wounding of fifty others. Dr. King's flouting of the law does not justify the the flouting by others of the law, but it is a terrifying thought that, most likely, the cretin who leveled his rifle at the head of Martin Luther King, may have absorbed the talk, so freely available, about the supremacy of the individual conscience, such talk as Martin Luther King, God rest his troubled soul, had so widely, and so indiscriminately, indulged in. – William F. Buckley, April 9, 1968. Buckley, in essence, blames the actions of Dr King's murderer on the message he advocated and preached. It is deeply disturbing that in Buckley's view, "submission to the law" is a component of non-violence. This confuses the admonition to "render unto Caesar" for a quite different notion: "submit to Caesar." This is definitely not what any notable advocate of nonviolence has ever had in mind, including Jesus himself. In light of this, please don't believe that dogwghistle racism and "blaming the victim" are in any way new to the right's discourses contra civil rights. I once thought rather highly of Buckley, but over the years I have seen more and more evidence to support the idea that he was, behind his high rhetoric, yet another defender of the Jim Crow status quo ante. The only thing actually new in our current Emperor is a certain incisive vulgarity – the content of the message is little changed. Yet it is the content of the message we need to be concerned about, not the manner of presentation. Our current president: "Why do we want all these people from Africa here? They're shithole countries …"
Ronald Reagan (or his speechwriter, I suppose): "I've spoken of the shining city all my political life, but I don’t know if I ever quite communicated what I saw when I said it. But in my mind it was a tall, proud city built on rocks stronger than oceans, windswept, God-blessed, and teeming with people of all kinds living in harmony and peace; a city with free ports that hummed with commerce and creativity. And if there had to be city walls, the walls had doors and the doors were open to anyone with the will and the heart to get here. That's how I saw it, and see it still." Say what you wish about Ronald Reagan. In terms of actual policy, Reagan was not that far removed from the current administration, to the extent either has any coherent policy besides a kind of reactionary anti-liberalism. But at least his rhetorical instincts were good – even in his twilight years (the above is from his Farewell Address). My friend Peter, who once lived here in Korea but is now a graduate student of Korean Studies in the US, dropped by on Friday morning. He travels back to Korea fairly regularly – which is a natural consequence of his major, I suppose. It's nice that he takes the time to visit. We seem to always find a lot to talk about. He's one of the few people who can talk intelligently about Korean politics and religion, two topics that interest me but for which it's nearly impossible for me to find others who care – there's a certain need for caution when expressing opinions or ideas on these topics with my Korean colleagues, and most "foreigners" (people like me) seem genuinely uninterested in such things. 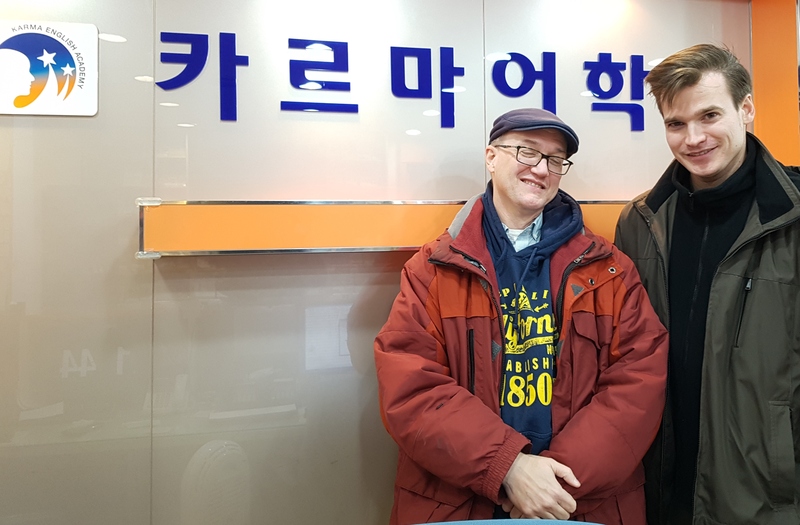 We spent some time concocting "just so" conspiracy theories (which I think neither of us would actually believe) about the "Korean deep state" vis-a-vis the weird preponderance of bizarre cults in South Korea and the North Korean situation. Or perhaps more accurately, I concocted and he encouraged me? Anyway, it's entertaining. Here's Peter and I standing in front of the Karma sign in the little lobby, when he dropped by with me there. 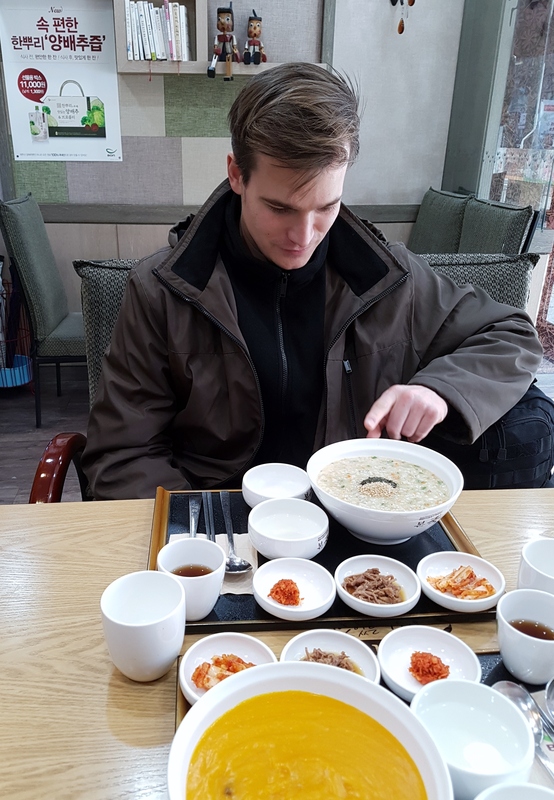 Here he is looking meditative over our lunch at the 본죽 [bonjuk = a chain of "juk" (congee Korean savory porridge) joints]. So this happened to that project called “United States of America.” The USA has jumped the shark. I have evidence. It doesn’t even matter if this is intentional satire or if it “real.” It is out there. History repeats itself, “the first as tragedy, then as farce.” – Karl Marx. At what point does satire, parody, or fiction also become reality (e.g. we have a president who emerged from the realm of “reality TV” – which has always been a type of fiction)? Finally – we must never, ever misinterpret stupidity or ignorance as evil. Hey, foreigners! Want some money? I had this brainstorm as I was walking to work through the snow, listening to NPR about the newly passed tax bill in the US Congress. So here's a rare 2nd blog post for this day. I have seen plenty of discussion of the way the new tax "reform" bill is essentially a wealth transfer from the poor and middle class to the wealthy. What seems less commonly commented upon is that it also will be a wealth transfer from US citizens to non-US citizens. This is remarkably dissonant with the Republican platform. I wonder what's going on. Let's think about it. Who holds US equities? Who are the owners of stock in US companies? Some brief googling found numbers from 2015, that stated that foreign ownership of US equities was 21%. While this may be not exact, it hardly seems that far off, either. The point would only be – that means 21% of the huge corporate tax break is benefitting wealthy non-Americans. Since the tax cuts are being financed by losses to government spending or by government debt, under best-case scenarios, or, by eventual higher taxes on US workers under darker scenarios, it becomes irrefutable that what the tax bill represents is not just a wealth transfer from the middle class (and poor) to the wealthy, but from Americans to foreigners. Is that what they want? I can't imagine they're really so ignorant as to not realize that. Who are the international wealthy who own all these equities? Russian oligarchs, Saudi princes, China's party-member nouveau-riche. Further, to the extent the tax bill is being financed by increased government debt, we need to also ask, who holds US government debt? One quick google search showed me that as much as half of US debt is held by foreigners. Now, to the extent that that debt is… debt, it's not really an asset transfer. But debt-holders are acquiring access to streams of future US revenue, in the form of interest payments on the debt (which come from taxes, right? ), so again, this boils down to a wealth-transfer from US coffers offshore. Who are these US debt holders? #1: China. #2: Japan. The Cayman Islands is high on the list – which is just a proxy for people who are rich but don't want you to know about it. You get the picture. They say this is going to help the US economy, right? How? Even if there's trickle-down (which is of course empirically questionable), it seems that a large chunk will be trickling into other countries' economies. Indeed, to the extent that super-wealthy South Koreans (e.g. the Chaebol families, such as the owners of Samsung or Hyundai) hold US equities or debt (which I'm sure they do), I may benefit more from this tax plan as a resident of South Korea than I do as an American citizen. And here's the snow I walked through. Although it's not that well-written (mostly due to the author not being a native English speaker), I found an interesting blog article by someone who goes by the online name giant_cheng (aka the profanely titled "Old Man and the Shit陈男旧屎"). It was compelling in its argument, for which he provides excellent evidence. To wit, the USSR in 1950 wanted the US to intervene in Korea. The idea was to bog down both the US and China in the Peninsula. In this, it succeeded masterfully. If you're interested in 20th century Korean history, I highly recommend it: link. [UPDATE 2017-12-08:] My friend David in Germany, a former college roommate who sometimes reads this blog, notes that the Filippov letter that giant_cheng quotes is referenced on this page at the Wilson Center. This is a much more professional take on the same question. I used to live about a block from Lake Calhoun, in Minneapolis. I associate my time living there with my huge (or anti-huge?) weight-loss project, in 2006-2007. I lost almost 60 pounds that year – and mostly, I kept it off, losing another bit after coming to Korea, and then a lot when I had cancer, and then gaining some of that last bit back. I've been pretty stable at 80 kilos since the bounceback from the cancer. Part of that process was my daily jogging. I would go out and run around the lake. I made a fixed habit of it. So you could say that I lost my pounds to the lake. And anyway, I have strong associative memories of the lake, my time living there, those daily runs, and the feeling of taking control back of my life. I recently learned that there has been a movement to rename the lake. I think that's maybe a good idea – it's named for that famous, pre-Civil War justifier of slavery. This has now started the approval process. 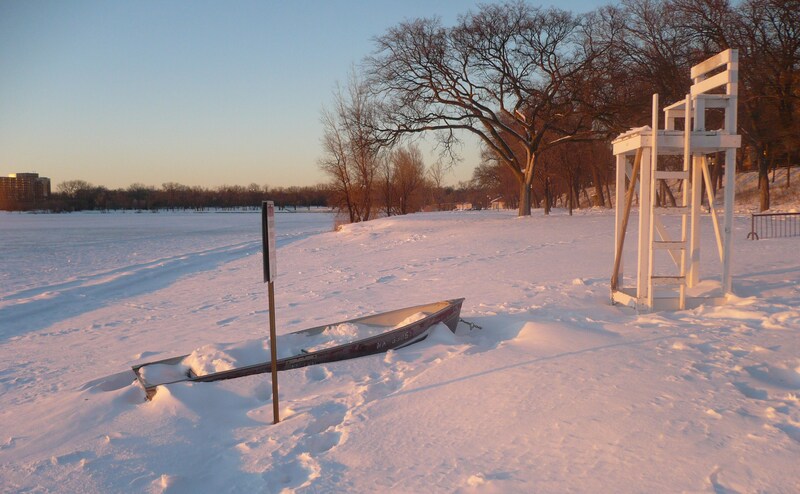 The new name is Bde Maka Ska ("White Earth Lake"). I think this is a wonderful new name. Having studied the Dakota language (if only a little bit), I was pleased to recognize two of the three words in this name. It's especially nice in the city of Bdeota (which is, afterall, Minneapolis' Dakota name, and means simply "Place of Lakes"). Most countries in the world frequently rename things, and I think it's generally interesting, if sometimes overly trendy to whatever is currently going on politically in a place. But this change I can support unequivocally. Here is a picture I took in 2009, during a brief visit to the old neighborhood, retracing my jogging route around the lake. There is a category of things that could be called "Fictional Victorian Doppelgängers for Famous Men." It has at least one member: Wilhelm Heinrich Sebastian Von Troomp. You can read about it at Politco Magazine. 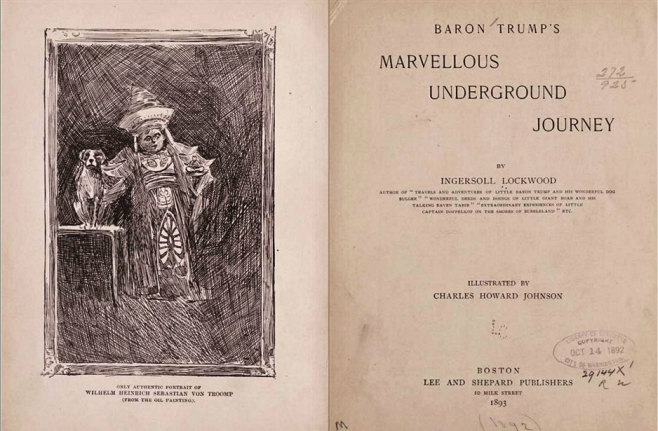 These works of childrens' literature by author Ingersoll Lockwood seem very bizarre, but not that different in genre from the subsequent Oz books, really, though apparently of lower quality. But the name of the protagonist is discomfiting. 30 years ago, South Korea was still a dictatorship, and the GDP per capita was the same as Mexico – which is where I was living at the time. Somehow, I never tire of this surprising, subsequent narrative about the divergence of these two economies. And it pops into my mind when I think about what Korea was like in that time. The video below made me think of that – because of the date. I present this image, which captures current Korean geopolitical angst, without comment. I'm not sure about its origin – somewhere on the internet. There's been a major earthquake in Mexico City, 32 years to the day after the 1985 quake. I didn't experience the 1985 earthquake, but I moved to Mexico City in January, 1986, and the city was still full of rubble and broken buildings at that time. I experienced a major delayed aftershock during my first months there, which was a bit scary. Now, I read through the news and see buildings with addresses that could very well be places I visited during my time living there. I'm not well in touch with anyone from that period of my life, but I hope they are OK. The Delegación Benito Juárez ("delegación" is like a borough in NYC or a 구 [gu] in Seoul) was apparently particularly hard-hit. My recollection is that that same delegación was also hard-hit in the 1985 event – I think it's related to the underlying geology combined with the age of the neighborhoods – the buildings are in the majority low-rise (5-10 story) apartment buildings built during the city's rapid growth in the 1930's-1950's. They're old, poorly built, crowded, and not well-maintained. Benito Juárez is working class. For nostalgia's sake, here's a rather bad picture of me in the garden at Leon Trotsky's house (now a museum), which happens to be right on the southern boundary of Delagación Benito Juárez. I visited there with my dad in 2007. Maybe that rickety brick tower fell down? I very much love Mexico City. In many respects, it remains my favorite city in the world. So I feel very sad. In fact, hanging out at my mom's house, I have a lot of free time. A true vacation, I guess. So I read books, as I tend to do. I have nearly finished this history of the Roman Republic which I picked up at random the other day. Sometimes I am struck by the parallels, culturally, militarily, or whatever, between late Republican Rome and the modern United States. Who shall be our Caesar? Julius Caesar was little more than a charismatic gangster, according this particular historian I'm reading. And it all makes sense. President Turnip is no Caesar, but is he a Marius? A Crassus? One of those guys, perhaps. Study your Roman history – I bet it's relevant. I think I'll take a walk and watch wallabies. Actually, in the moment, I have nothing much interesting to say. I'm trying to get ready for my departure, Saturday. I have a lot of things to do, because I procrastinate a lot. So my focus is poor. Meanwhile, for your entertainment, I recommend this humorous and insightful article about the current state of the US political economy (in the vaguely post-marxian sense, I guess), vis-a-vis culture. I ran across this argument on an online political website, but I don't recall where. Nevertheless, the longer I've mulled it over, the more plausible it's become in my mind. I'm sorry I don't have a proper attribution for the idea – to be clear, it wasn't my idea originally. Consider that the whole "Russiagate" thing is actually more to the advantage of the Republican Party than to the Democratic Party. Without Russiagate, Abu Ivanka is a loose cannon that even Republicans can't control, and certainly his less orthodox notions, evidently somewhat toxic to the Republican Elite, are incompatible with what they want to achieve (to wit: social conservatism, scaling back the welfare state, tax reductions, etc.). But with Russiagate always looming, the Republicans in Congress can say to AnnoyingOrange, "You need us. 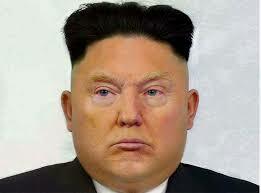 If you betray us, we can impeach you." Russiagate is a leash for the beast they unleashed to win the election. Contrariwise, why should the Democrats be pushing Russiagate? It serves them no purpose – they can't get an impeachment without Republican cooperation, and it just ends up revealing their own dirty laundry as well – of which I'm sure they have plenty. I'm not normally one for so-called "conspiracy theories," but this one fits the data neatly, and personages like Mueller, the special prosecutor (and former Bush II appointee), are evidently more establishment Republicans than Democrats, anyway. Bannon's recent departure actually just seems further evidence – his "extreme views" annoyed the establishment Republicans. Because of their leverage, they insisted (either directly or indirectly, it doesn't really matter) that he go. So he went. Of course directly controlling Turnip's twitterings is harder. So they just tolerate it, as raw meat to toss out for the so-called "base." Meanwhile the backchannel disassembly of the welfare/regulatory state can proceed apace. The below was written by Roger Fisher, in The Bulletin of the Atomic Scientists, in 1981. My favourite activity is inventing. An early arms control proposal dealt with the problem of distancing that the President would have in the circumstances of facing a decision about nuclear war. There is a young man, probably a Navy officer, who accompanies the President. This young man has a black attache case which contains the codes that are needed to fire nuclear weapons. I could see the President at a staff meeting considering nuclear war as an abstract question. He might conclude: "On SIOP Plan One, the decision is affirmative. Communicate the Alpha line XYZ.." Such jargon holds what is involved at a distance. My suggestion was quite simple: Put that needed code number in a little capsule, and then implant that capsule right next to the heart of a volunteer. The volunteer would carry with him a big, heavy butcher knife as he accompanied the President. If ever the President wanted to fire nuclear weapons, the only way he could do so would be for him first, with his own hands, to kill one human being. The President says, "George, I’m sorry but tens of millions must die." He has to look at someone and realize what death is – what an innocent death is. Blood on the White House carpet. It’s reality brought home. "When I suggested this to friends in the Pentagon they said, "My God, that’s terrible. Having to kill someone would distort the President’s judgement. He might never push the button." Unrelatedly (except for maybe the vague atmospherics of 1980s-era nuclear angst), what I'm listening to right now. 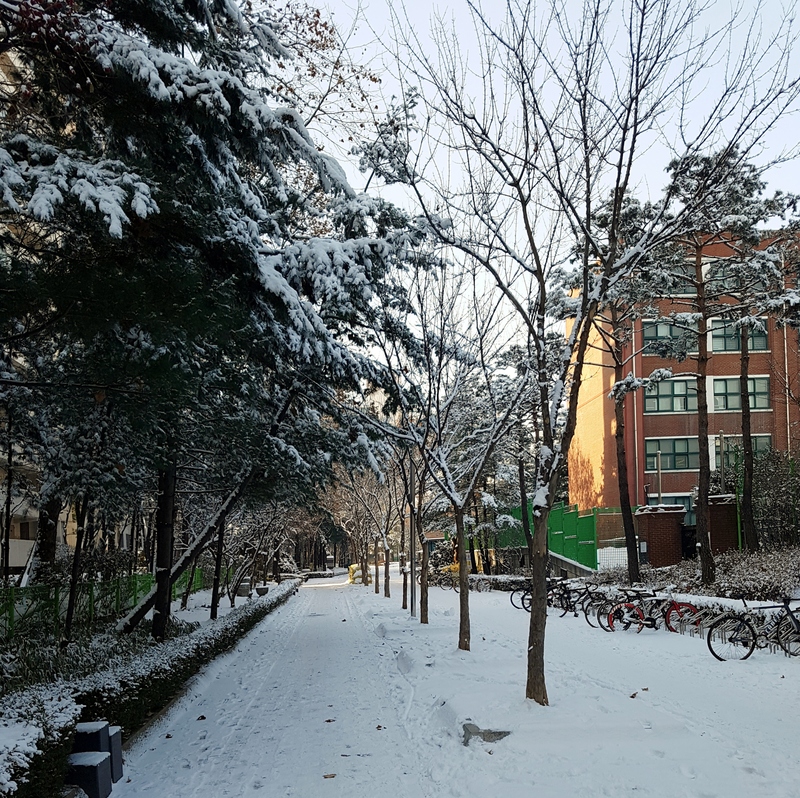 In 1991, I was a US Army soldier, stationed at Camp Edwards, Paju, Korea – a few kilometers from the DMZ and a few kilometers (5 subway stations) from where I live now. I had a Laotian-American barracksmate, with the euphonious surname Inthalangsy, who was a gangbanger from Houston who'd been offered one of those "join the Army or go to jail" options that judges seem to used to have had the option of offering. Inthalangsy was a die-hard New Order fan, and so this song was on very heavy rotation in our barracks room. The Korean soldiers (KATUSAs) didn't like it, and I think Inthalangsy played it partly because he knew it annoyed them. It grew on me. To understand what I mean, consider that I'm speaking, specifically, of me – I don't mean, here, some generic "me." I mean, I am a guy who lives about 20 km from North Korea. On a clear day, I can see North Korea from the top of a nearby hill – and that's not Sarahpalinesque hyperbole, either. Apropos of nothing in particular, I'd like to make a political observation. If considered in terms of fulfilling the implicit (as opposed to explicit) promises of his campaign, the current US president is one of the most successful in recent history. That's because the implicit promise of the campaign, whether we want to admit it or not, was to destroy the government. Abu Ivanka was undeniably elected by a contingent of the American public who despises gubmint. Well, the Orange-coiffed Emperor is doing just what those people most desire, in their deepest yearnings. So who has any right to complain? If you don't like it, change the discourse. The culture itself propagates these beliefs that government is bad. Start there in finding a solution. Or, if you're happy to see the government burn, just remember – anarchy generally doesn't work out as well as the idealists imagine. I have been wondering, since the election of Moon Jae-in in May, if the new president would attempt to resurrect the "Sunshine Policy" toward North Korea. Given the changed political context, both with a less sympathetic international regime (i.e. populism and resurgent nationalism in various countries) and with the North's nuclear and ICBM efforts, I don't quite see how this would work. His recent speech given while in Germany is short on details (of course), but it does seem to outline a return to his party's roots as established by Kim Dae-jung and Roh Moo-hyun from 1998-2008. The one major policy aspect I most question is his focus on reunification. I should think that emphasizing reunification – especially on the German model – would be more likely to annoy the North than encourage it. It's not like the German reunification played out as if between equals. But I suppose Moon was sincerely trying to adapt his message to his audience, in this case, and reflecting that post-Soviet 1990s moment that was undoubtedly formative for him, personally.